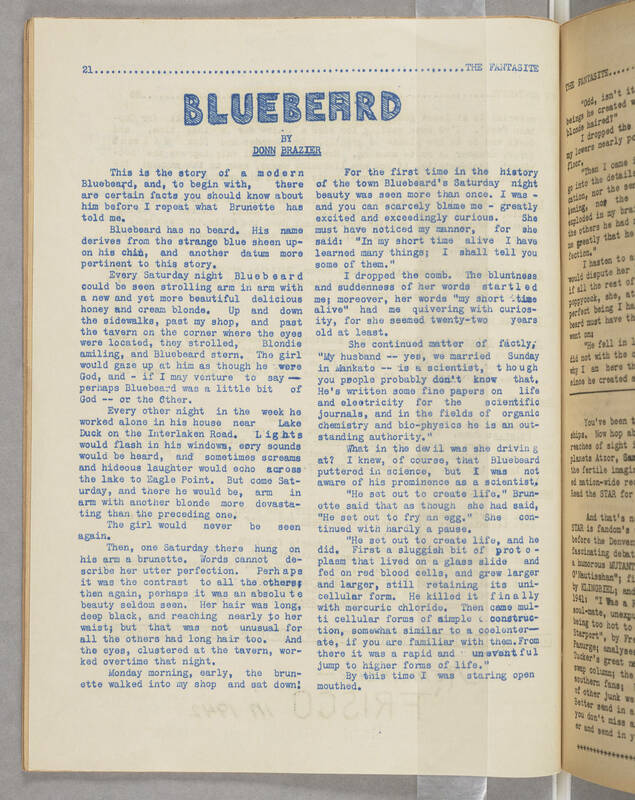 21 THE FANTASITE BLUEBIRD BY DONN BRAZIER This is the story of a modern Bluebeard, and, to begin with, there are certain facts you should know about him before I repeat what Brunette has told me. Bluebeard has no beard. His name derives from the strange blue sheen upon his chin, and another datum more pertinent to this story. Every Saturday night Bluebeard could be seen strolling arm in arm with a new and yet more beautiful delicious honey and cream blonde. Up and down the sidewalks, past my shop, and past the tavern on the corner where the eyes were located, they strolled, Blondie amiling, and Bluebeard stern. The girl would gaze up at him as though he were God, and - if I may venture to say - perhaps Bluebeard was a little bit of a God -- or the Other. Every other night in the week he worked alone in his house near Lake Duck on the Interlaken Road. Lights would flash in his windows, eery sounds would be heard, and sometimes screams and hideous laughter would echo across the lake to Eagle Point. But come Saturday, and there he would be, arm in arm with another blonde more devastating than the preceding one. The girl would never be seen again. Then, one Saturday there hung on his arm a brunette. Words cannot describe her utter perfection. Perhaps it was the contrast to all the others; then again, perhaps it was an absolute beauty seldom seen. Her hair was long, deep black, and reaching nearly to her waist; but that was not unusual for all the others had long hair too. And the eyes, clustered at the tavern, worked overtime that night. Monday morning, early, the brunette walked into my shop and sat down! For the first time in the history of the town Bluebeard's Saturday night beauty was seen more than once. I was - and you can scarcely blame me - greatly excited and exceedingly curious. She must have noticed my manner, for she said: "In my short time alive I have learned many things; I shall tell you some of them." I dropped the comb. The bluntness and suddenness of her words startled me; moreover, her words "my short time alive" had me quivering with curiosity, for she seemed twenty-two years old at least. She continued matter of factly, "My husband -- yes, we married Sunday in Mankato -- is a scientist, though you people probably don't know that. He's written some fine papers on life and electricity for the scientific journals, and in the fields of organic chemistry and bio-physics he is an outstanding authority. What in the devil was she driving at? I knew, of course, that Bluebeard puttered in science, but I was not aware of his prominence as a scientist. "He set out to create life." Brunette said as though she had said, "He set out to fry an egg." She continued with hardly a pause. "He set out to create life, and he did. First a sluggish bit of protoplasm that lived on a glass slide and fed on red blood cells, and grew larger and larger, still retaining its unicellular form. He killed it finally with mercuric chloride. Then came multi cellular forms of simple construction, somewhat similar to a coelenterate, if you are familiar with them.From there itw as a rapid and uneventful jump to higher forms of life." By this time I was staring open mouthed.